May 8, 2013 - A team at Hanscom Air Force Base, Mass. (AFNS) is working to improve safety for warfighters by increasing accuracy of high altitude airdrops with mission planning tools. The Joint Precision Airdrop System, or JPADS, is a family of equipment that consists of parachutes, mission planning systems, global positioning systems and computer hardware and software. The parachutes are guided by GPS to accurately deliver necessary supplies to warfighters in remote locales and austere environments. "This need has multiplied greatly, especially during Operation Enduring Freedom," said Capt. Sean Carlson, the JPADS- MP section lead. For the mission planning personnel at Hanscom AFB, the work to make the delivery happen begins with the consolidated airdrop tool. The CAT is software that receives weather information and runs aircraft performance and weather algorithms to provide the correct readings for where the aircraft needs to be in the air to ensure the load hits the intended point on the ground. Maj. Daniel Hilferty (left) and Capt. 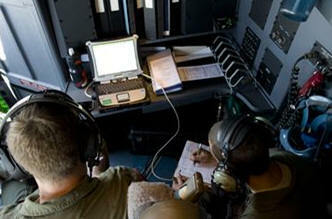 Joshua Linden (right) review the Joint Precision Airdrop System, or JPADS, data prior to an airdrop during a training mission Aug. 14, 2012, at Fort Hood, Texas. JPADS is a cargo parachute system that incorporates an onboard global positioning system able to guide the cargo with pinpoint accuracy to a designated drop zone. JPADS also allows cargo to be dropped from higher attitudes, allowing aircraft to safely avoid enemy ground fire. Hilferty is assigned to the 317th Operations Support Squadron. Linden is assigned to the 40th Airlift Squadron. "We're always enhancing calculations and trying to make the information more precise," Carlson said. "The aircraft currently does a pass to get the most recent weather data and then a separate pass to do the drop. We're looking to see if we can improve the accuracy enough so there would only be a need for one pass." Presently, a dropsonde is released at an initial calculated point to measure wind conditions which are then relayed back to the aircraft via a UHF receiver. The dropsonde and UHF receiver are parts of a roll-on roll-off hardware kit called mission support equipment that make gathering the most recent weather possible. The data is then transmitted to a laptop aboard the aircraft with the CAT software on it. The release point is then recalculated with the most up-to-date weather data. According to program officials, they are constantly working to make advancements on both the software and hardware mission planning tools. A production decision for a new dropsonde, designated ASondeR3.0, is expected soon. "We received a positive report from the Operational Utility Assessment, which tested the upgrades to improve usability," said Brigitte Darton, the MSE PM. This version makes it possible for users in the field to now replace the batteries themselves, and the on/off switch has also been enhanced. Previously, the user would have to insert a small plastic stick into a port on the side of the dropsonde to turn it on. The dropsonde now has a slide switch, similar to those found on many flashlights. "This makes it much easier for the crew to operate, especially with flight gloves on," said Darton. Other recent hardware advancements include more ruggedization and a built-in testing feature to ensure the equipment is operational prior to use. The team here will be working on technical publications and certification, and has initiated an interim contract to sustain the MSE until the sustainment work transfers to Robins AFB, Ga., and Hill AFB, Utah by fiscal 2015. The software has also evolved, with the merging of applications that were operating on two separate laptops to one. "One laptop would be running mission planning mapping tools, such as FalconView, while the JPADS would be on another," said Capt. Neil Catron, the JPADS-MP software program manager. "The first CAT release combined everything, making it more efficient." The current CAT 2.1 update, which is largely a maintenance build, also includes the ability to send roadway heading data to Army-developed Airborne Guidance Units, allowing for even more precision in the landing. This update has been turned over to the customer, Air Mobility Command, for anticipated fielding this month. "We're always looking for improvements and we release an updated software version with new capabilities about every six months," Carlson said. For the upcoming 2.2 version, the team is working to incorporate a wireless gate release system being developed by AMC. Currently, a crew chief or loadmaster must physically cut cables to ensure loads don't collide upon release. Now the CAT will be able to transfer coordinates and timing to allow for automatic cutting to release the bundles. "The wireless gate release system is not fielded yet, but often software will have to catch up. This time we're out in front," Carlson said. "Our whole goal is always trying to improve precision." It is anticipated that CAT 2.2 will be fielded by the first quarter of fiscal 2014, and development efforts for versions 3.0, 3.1, and 3.2 have already started. The team said they work closely with their partners from the Army to incorporate new chute data into calculations, and to provide additional data transfer from the CAT to the AGU for enhanced accuracy. "With every update or release, the Army and Air Force personnel are happier with what we can provide," Carlson said. "It helps them do their job better."